Ursula Le Guin (naskiĝis la 21-an de oktobro 1929), eminenta pioniro de feminisma sciencfikcio, ĵus mortis, la 22-an de januaro 2018. Mi republikigas kun permeso korespondaĵojn inter Paul Olchvary, usona eldonisto de la anglalingva traduko de Kazohinio, kaj Le Guin. Olchvary celis havigi el Le Guin tekstreklamon por la dorskovrilo de eldonota Kazohinia, sed ŝi decidis ne plenumi tiun peton. Mia tekstreklamo inter aliaj troveblas en tiu eldonaĵo. Pioneering feminist/anarchist science fiction writer Ursula Le Guin (October 21, 1929 – January 22, 2018) just died. My colleague Paul Olchvary, publisher of the American edition of the English translation of Voyage to Kazohinia, has given me permission to publicize his correspondence with Le Guin, reproduced below. Olchvary requested her to blurb Szathmári's novel, but as you can see, she declined. I accepted his invitation, and thus our collaboration began. I doubt that I'm the right person to send a 1941 satirical dystopia to, but I'm willing to find out--particularly if you would send me only the first chapter or two of Sandor Szathmari's book. It is depressing to receive a whole novel, either electronically or on paper, and realise it's not going to be a book you want to read/blurb. Of course one can't always be certain from one chapter, but often one can; and in that case it is easier on everyone if the whole camel isn't already in the tent. If I liked the camel's nose, of course I would invite the whole camel to come in. I went to Wikipedia but could find nothing there. However, it doesn't matter, as it is the book I would read and respond to, if I do--not to things written about the book. There is no reason why you should copy and send me the galleys, since I can access the book online. And since I have been warned, and will be reading fast and lightly, just to see whether this is a book I want to go on with, faults in the copy editing won't bother or delay me. If it seems likely that I might be able to write you cover copy for the book, I'll ask you to send it me the full text; if it does not seem likely, I will not ask you. The painful part of being asked to provide a blurb comes when one, for any of a hundred reasons, cannot do it, and must say no. If I can say yes, I will write you within the week. If I can't, I won't--my camel will regretfully, but silently, retreat from your tent. I am afraid my camel is too heavy laden at present even to try to get into the tent. I'm very sorry. Thank you for the note from Inez, and my best wishes for calm seas and a prospering wind for the Voyage to Kazohinia. Elstaras je Miĥalski lirikeco, erotiko, kaj eksperimenta plivastigo de la lingvaj eblaĵoj de Esperanto. La unue menciita poemo (Amaj melodioj: III, kiun mi deklamis sonregistre okaze de la 121-a datreveno de Miĥalski) estas lirika kaj erotika, kun kelkaj interesaj kunmetitaĵoj kaj gramatikaĵoj--'disburĝonis kaŝtanaj', 'kreiv-geedziga'. 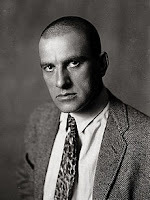 Kiel evidentas en la poemaro Prologo (1929), Miĥalski sopiris al nova mondo, tiel profetante pri la 'os', kaj li ankaŭ estis pioniro de poezia stilo en Esperanto. Do, du-kiale, ne surprizas ke Eŭgeno Miĥalski entuziasmus pri la avangarda sovetrusa poeto Vladimir Majakovskij. La centrigo de politika potenco de Stalin fine de la 1920aj jaroj efikis ankaŭ fini la viveblecon de la arta avangardo. Majakovskij mortpafis sin je la 14-a de aprilo 1930. Miĥalski verkis la omaĝan poemon la 26-an de junio 1930. Miĥalski fariĝus viktimo de la Stalina teroro; li estis mortpafita la 15-an de oktobro 1937. Ĉi-poeme oni trovas laŭdadon de la novo kontraŭ kaduka kaj filistra sociordo, en kombino kun la pionira lingvaĵo de Miĥalski. 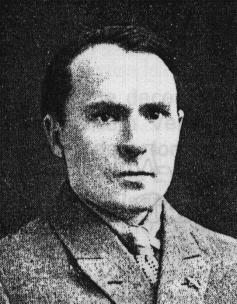 Ĉi tiu poemo finfine aperis kaj estas la lasta poemo en Plena Poemaro 1917-1937, antologio de Miĥalski redaktita de William Auld kun enkonduko de Krys Ungar (Antwerpen: Flandra Esperanto-Ligo, 1994; p. 175-176). Do jen funebro fare de Miĥalski pri Majakovskij. Kaj ni, la posteuloj, funebras pri Miĥalski. "Amaj melodioj: III" de Eŭgeno Miĥalski, Voznesensk, 11 Decembro 1923. Ĉi tiu poemo aperis en la poemaro Prologo (1929) kaj troveblas ankaŭ en Plena Poemaro 1917-1937, red. William Auld, kun enkonduko de Krys Ungar (Antwerpen: Flandra Esperanto-Ligo, 1994), p. 63-64. 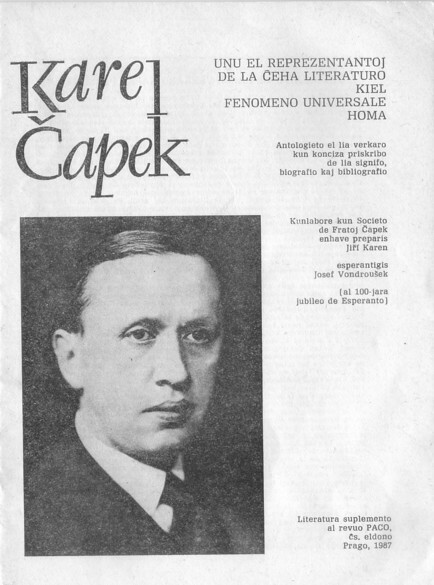 Hodiaŭ estas la naskiĝtago de Karel Čapek (9 januaro 1890 – 25 decembro 1938). Hodiaŭ aperas ankaŭ afiŝo pri Karel Čapek de Antonio De Salvo ĉe blogo Esperanto-vivo, kiu inkluzivas retligojn kaj bibliografion, kiu ampleksas ankaŭ verkojn ne alireblajn interrete. Karel Čapek - Fabelo "Solimana princidino", el Naŭ fabeloj (1932), el la ĉeĥa esperantigis Josef Vondroušek, "laŭtlegas Tadeusz Karaš (el Brajla skribo!) kaj lia edzino Ivana Karašová, ambaŭ membroj de la Sekcio de nevidantoj de Ĉeĥa Esperanto-Asocio"